The latest weekly report of United States Mint numismatic sales includes the debut figures for several new products. Coinciding with a decline in precious metals prices, gold coin sales experienced a dramatic slow down after last week’s robust sales. 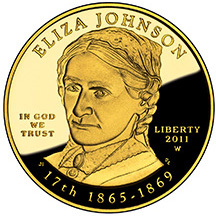 The Eliza Johnson First Spouse Gold Coins went on sale at the US Mint on May 5, 2011. Through the reporting date of May 8, US Mint recorded sales of 1,331 proof coins and 777 uncirculated coins, for a total of 2,108 across both options. This represents the slowest start for an issue of the one-half ounce 24 karat gold coin series since 2009. Last year’s releases had debut sales figures of 2,881 for Abigail Fillmore, 2,434 for Jane Pierce, 6,127 for James Buchanan’s Liberty, and 5,505 for Mary Todd Lincoln. The low initial sales for the Eliza Johnson coin may have been partially attributable declining gold price, which caused some buyers to delay purchases in hopes of lower prices. So far, it doesn’t seem like a product price decrease will occur for the current week. The 2011 Proof Gold Eagles saw sharply lower sales, perhaps for the same reason. The numbers for each of the product options were down from 74% to 87% from the levels seen in the prior week. Commemorative gold and silver coin sales also showed declines, but to a lesser extent. The 2010-P Hot Springs National Park Five Ounce Uncirculated Coins are only a whisper away from selling out, with orders placed for 26,866 coins out of the total 27,000 mintage. When sales began on April 28, the flood of initial orders took down the US Mint’s website. The next numismatic release for the five ounce silver coins will take place on May 17. The US Mint resumed sales for the four different Silver Proof Sets on Thursday of last week. These products had been suspended when the price of silver broke above $40 per ounce. Orders were placed for 4,831 of the 2011 Silver Proof Sets and 3,303 of the 2011 ATB Quarters Silver Proof Sets. The 2010-dated sets showed lower sales, as buyers focused on the newer releases. Update: Sales figures are now available for the recently released 2011-W Uncirculated Gold Eagle. it looks like 2011w american eagle uncirculated one ounce gold coin is zero. I didn’t get a number for that one. I am working on it. I noticed a whole lot of “zeros” within the Presidential First Day Coin Covers, a series that almost always shows some level of sales activity from week to week. Seems unrealistic. Any possibility that the Mint failed to update this portion of the data? I had been pursuing one of each in the series up through the Lincoln issue, but decided to walk away after the Mint drastically changed the appearance of the product with their new Marketing Brand. I think overall participation in this series will continue to fall off with Johnson and the future issues. Yes, it’s likely that the zeros are the result of the US Mint not updating the data.This happens intermittently for the coin covers and coin & medal sets.